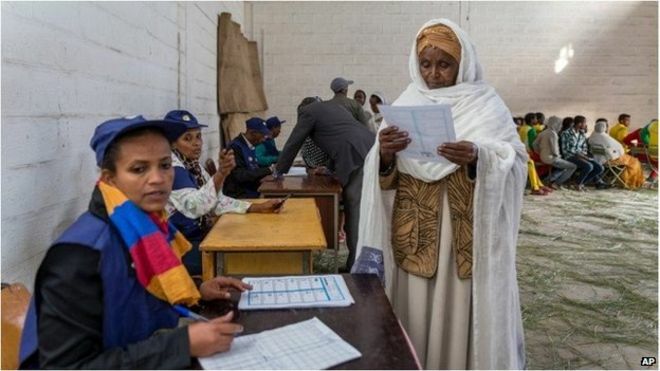 Ethiopia's ruling party, the EPRDF, and its allies have won every single parliamentary seat in May's elections, according to official results. This includes the one seat held by an opposition politician following the 2010 poll. Election commission chairman Merga Bekana made the announcement saying the elections were credible and free and fair. Opposition parties have said that the process was rigged. African Union observers described the 24 May vote as "calm, peaceful and credible" and that "it provided an opportunity for the Ethiopian people to express their choices at the polls". Beyane Petros, the leader of Medrek, one of the main opposition coalitions, said last month that there was no election to speak of as it was not conducted in a fair way, according to the Horn Affairs website. Medrek has said that hundreds of its members and supporters have been arrested and beaten in recent months, according to an opposition website. The EPRDF has been in power since the overthrow of the military government in 1991. In 2005 official results said the opposition won more than 150 seats, but the opposition claimed the figure was much higher. More than 190 people were killed as protesters clashed with police in the wake of the announcement of those results, an independent report found. The government says the number was much lower. In the two elections since then the EPRDF has dominated the parliament.